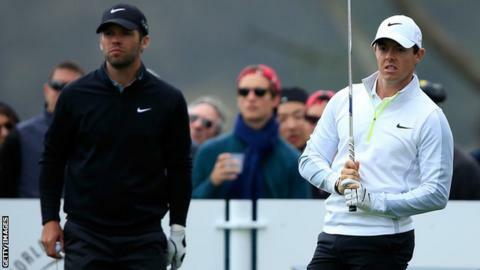 Rory McIlroy and Paul Casey could not be split after 21 holes as darkness halted their quarter-final in the WGC Match Play in San Francisco. They will return at 14:45 GMT (06:45 local time) to decide who will play American Jim Furyk in the semi-finals. Casey, 37, was one up on the 17th before three-putting to allow Northern Ireland's McIlroy, 25, to level. Casey's fellow Englishman Danny Willett, 27, faces 30-year-old American Gary Woodland in the last four. Willett beat compatriot Tommy Fleetwood 4&3 while Woodland was a 5&3 winner over Australian John Senden. Furyk, 44, beat South African Louis Oosthuizen 4&2 to reach the semi-finals. After reaching the regulation 18 holes level, Casey and McIlroy both missed chances to win their tie. "It really was dark, whatever the TV cameras were showing and both of us agreed," said Casey. McIlroy had earlier beaten Hideki Matsuyama 6&5, wile Casey saw off former Masters champion Charl Schwartzel 2&1.